How to watch Hellboy II: The Golden Army (2008) on Netflix India! Sorry, Hellboy II: The Golden Army is not available on Indian Netflix, but you can unlock it right now in India and start watching! With a few simple steps you can change your Netflix region to a country like France and start watching French Netflix, which includes Hellboy II: The Golden Army. We'll keep checking Netflix India for Hellboy II: The Golden Army, and this page will be updated with any changes. Hellboy II: The Golden Army is not available in India BUT it can be unlocked and viewed! The identities of Hellboy, Liz Sherman and Abe Sapien are exposed as they face a new threat: The Golden Army is preparing to attack. Fantastic creatures are crafting an unspeakable army bent on man's very demise. Our only hope? The cranky spawn of hell. There is a way to watch Hellboy II: The Golden Army in India, even though it isn't currently available on Netflix locally. What you need is a system that lets you change your Netflix country. With a few simple steps you can be watching Hellboy II: The Golden Army and thousands of other titles! 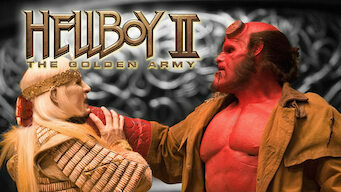 Watch "Hellboy II: The Golden Army"